With all the news coming out of Virginia Tech about burrito-delivering drones, self-driving vehicles and autonomous underwater craft, it’s easy to forget the university began as, and continues to be, an agricultural school. As incongruous as it may seem, robotics and agriculture often overlap, and innovations emerging at that intersection are almost certain to grow. 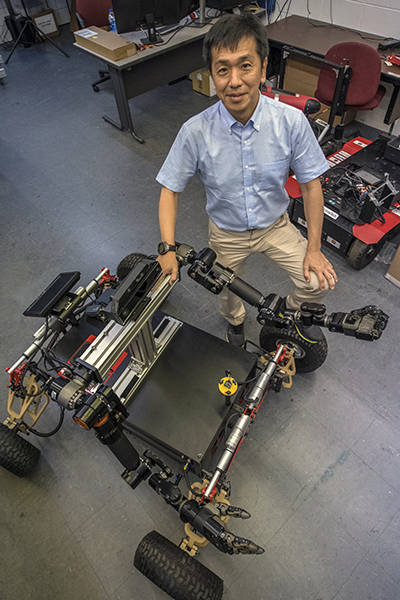 Associate Professor Alexander Leonessa, for instance, advised two student teams who collaborated to win the 2018 agBOT Challenge, a national competition to see whose robot can best perform an agricultural task. 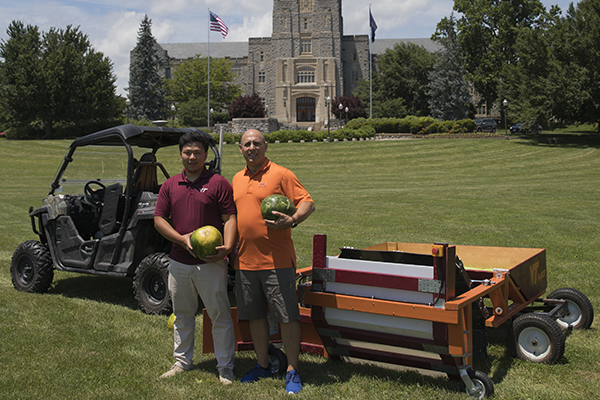 The challenge in this year’s competition was to create an autonomous watermelon-harvesting machine. One of the Virginia Tech teams concentrated on getting the harvester in place. The other focused on evaluating and harvesting the melons. The resulting collaborative system had to perform on its own. The winning watermelon harvester is a two-part system. An ATV equipped with sensors finds the watermelons and positions the harvester so it can place each melon into a trailer. But first, the harvester has to be sure the watermelon is ripe. It makes that decision the same way many people do — by thumping the melon and listening for a deep, hollow sound. The harvester slaps each melon and measures the resulting sound against a frequency range ripe watermelons generally produce. The system’s design was the result of a four-month process, Leonessa says. Students considered several options, including using a robotic arm to lift the melons into the trailer. That option was complicated and expensive. The final version, Leonessa says, is relatively inexpensive, while being easy to use and maintain. It’s also successful, winning the contest’s top prize of $30,000. That money will go toward next year’s agBOT Challenge and other projects, Leonessa says. He says that while he would entertain proposals to commercialize the watermelon harvester, that’s not really the point of the project. It was a senior project in a two-semester class that gives undergraduates a chance to prove they can design, develop and build a prototype that will solve a problem. Other robotic farming projects are much more directly aimed at commercialization. 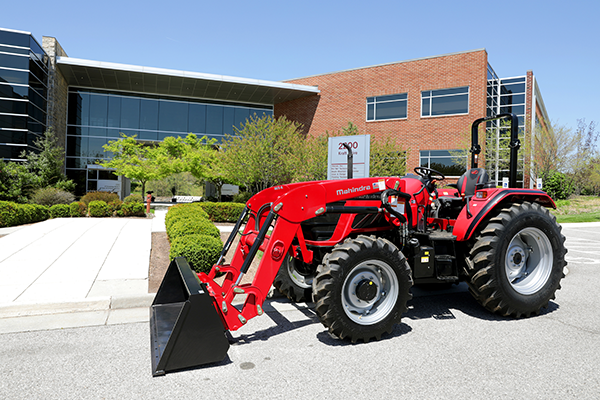 Mahindra Group, for instance, established the Mahindra AgTech Center at Virginia Tech in the Virginia Tech Corporate Research Center in Blacksburg. Mahindra, a $19 billion federation of companies based in India, has more than 200,000 employees in 100 countries. While Mahindra’s business interests range from aerospace to financial services, it sells more tractors than any other company in the world. The first project of Mahindra AgTech Center is to develop a robotic table grape harvester that can be mounted on those tractors. People have been trying to build such a harvester for decades, but they’ve never succeeded, says Professor Tomonari Furukawa, the project leader. The problem, he explains, is two-fold. Technology hasn’t been up to the complicated task, and researchers were aiming too high. Time and research may have solved the first problem. A change in approach may have taken care of the second. Furukawa doesn’t want to guess how long he and his team of doctoral students will be working on the grape harvester, but he says the timeline will probably be measured in years. Another project aiming for commercialization is a three-year study funded by an NSF Partnership for Innovation grant that explores how assistive, wearable robotics might help farmers work longer and more efficiently while avoiding wear on their bodies. His team plans to develop assistive robotics — ranging from knee braces to exoskeletons — to reduce that toll. The devices will provide stability and support, but they will also give farmers additional strength. They may allow farmers to handle their daily tasks more easily so that they can continue to work years longer. Because of the hard work and the large investment new farming operations require, fewer people are interested in farming as a career. Therefore, improving farmers’ efficiency, endurance and health are increasingly important. The project is recruiting farmers now. Participants will visit a physical therapist to see what kinds of apparatus might benefit them. Leonessa’s team will outfit the farmers, who will go back to the physical therapist to make sure everything seems to be working as it should. Then farmers will head out into the field, and researchers will evaluate the robotics’ efficacy. While a farmer in wearable robotics might sound like a plot element in a sci-fi novel, Leonessa points out that futuristic technology already is embedded in modern agriculture. Farmers use drones and GPS devices to help them decide when and where to plant, water and fertilize their crops and also when and where to apply pesticides and herbicides. There’s no reason to think technology’s role won’t continue to grow. “I tell my students, I look forward to the day when, to be a farmer, you need a degree in computer science,” he says. Leonessa is half-joking when he says that. But only half.